According to the latest monthly Global Ad Trends report of WARC, out of home has accounted for an average of 5.9% of global advertising spend since 1990. Its share of global adspend has steadily decreased since 2012, but is stable over the long term. The latest verified data shows that OOH adspend amounted to $31billion in 2016, a 5.8% share of the global total. Preliminary estimates for 2017 put the spend at roughly the same level. Excluding search, classified and other spend, OOH accounts for 7.9% of the global display ad market. Budget allocation to out of home by successful brands within WARC's case study database has averaged 13% over the eight years to 2016. OOH's share has remained largely stable, which tallies with the channel's share of global display advertising spend. The report also finds that government and non-profit organisations (26% of budgeted spend), alcoholic drinks brands (16%) and retail brands (14%) are among the highest investors in OOH. 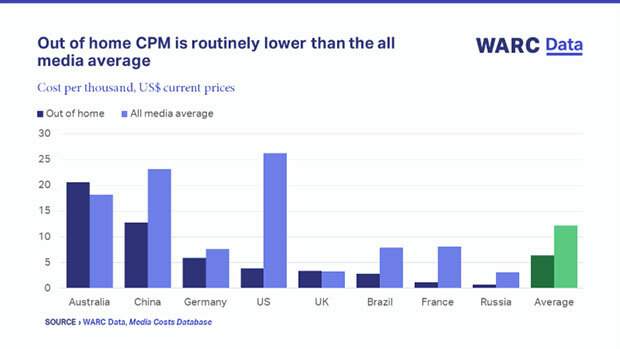 Data from WARC's Media Costs Database show that out of home cost per thousand (CPM) in key markets is routinely lower than the all-media average. Australia and the UK are the only exceptions. The average CPM for an outdoor ad with an all-adult target audience in key markets is $6.41 compared to an all-media average of $12.20 for the same audience. Data shows that digital's share of total global out of home advertising spend reached 34.8% in 2017. Long-term projections suggest digital's share will rise close to 45% in 2021. Data from WARC's international partners show that digital's share of total OOH adspend varies by key market and is increasing rapidly in all. In Australia, digital out of home (DOOH) adspend was at 40.2% in 2016 and likely to be above 45% in 2017. Preliminary estimates for 2017 put the United Kingdom's DOOH share at 46.5% up from 37.7% in 2016; and in the US it is thought to be 22.4% in 2017 up from 20.8% in 2016. Facial Recognition Technology (FRT) is being trialled as a means of offering shoppers more targeted information in stores. In a recent national survey, WARC and Toluna conclude that UK consumers are open to the application of FRT for products and services as well as for security purposes, but do not find the concept of personalised marketing messages appealing. Summing up, James McDonald, Data Editor, WARC, said, "Out of home is an industry staple, attracting a consistent share of successful brands' budgets over the long term. The channel delivers affordable reach with CPM routinely below the all media average. Out of home is well placed for future advancement with rising digital penetration delivering flexible creative informed by rich audience data. New tech, such as facial recognition, is being tailored to improve shopper experience, but advertisers need to heed consumer concerns." Aimed at media and brand owners, market analysts, media, advertising and research agencies as well as academics, WARC Data provides current advertising and media information, hard facts and figures – essential market intelligence for ad industry-related business, strategy and planning required in any decision-making process.